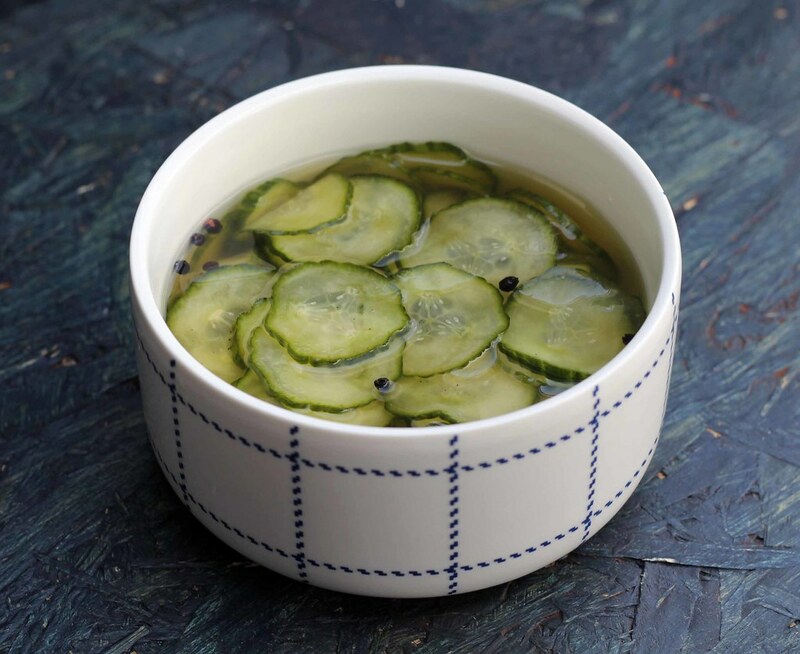 This recipe for cucumber salad is very popular in Denmark and a lot of Danes will remember having had these their entire life. In Danish this side dish is called Agurksalat which directly translated means Cucumber Salad and are a kind of variation of sliced pickles. 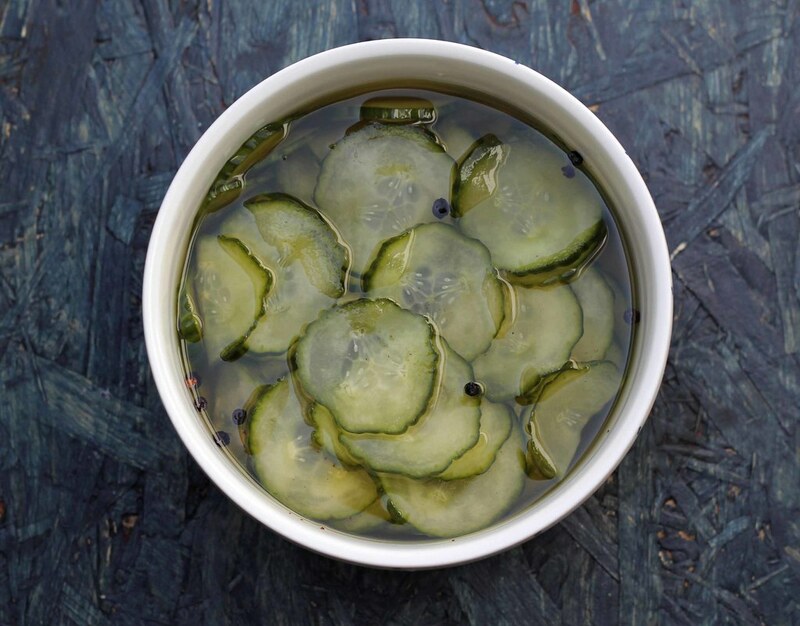 These cucumbers have a thin peel which is very crisp and together with the salty vinegar mixture they have a very refreshing and delicious taste. This is the original recipe for cucumber salad, it’s super easy to make and the taste is way better than the ones you can buy at the supermarket. We have used this recipe many times and can highly recommend it. We normally serve these as a side dish to pork meat, as topping for a hotdog or maybe as topping for hamburgers. If you are looking for a great recipe for homemade burger buns we can recommend this one. Step 1: Mix the vinegar, boiling water, sugar and pepper grains in a bowl. Stir until the sugar has completely dissolved. Step 2: Rinse the cucumber and cut it in very thin slices. Put them on a plate or similar and add the salt. Let them soak in the salt for about 10 minutes. Step 3: Use your hands to press out the water from the cucumbers. Put them in a strainer and rinse them shortly in cold water. Step 4: Clean a glass jar using boiling water. It’s important that it’s completely clean – this will make the cucumber salad last longer. Step 5: Pour the vinegar mixture and the sliced cucumbers in the jar. 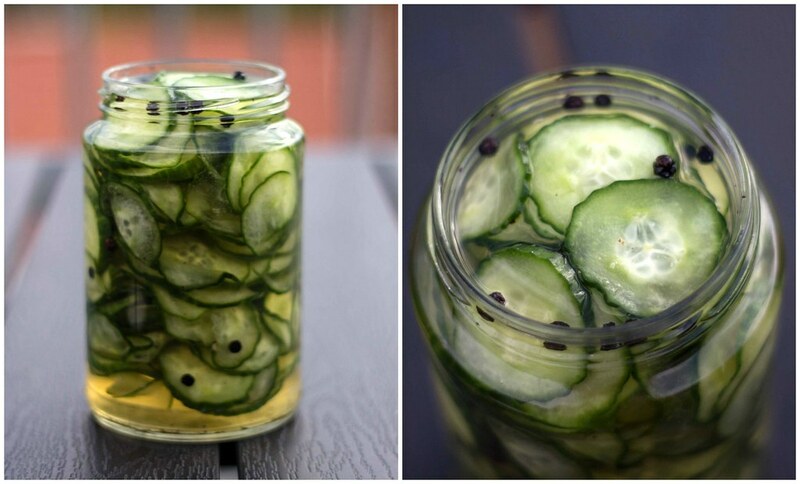 Let the cucumbers soak in the vinegar for at least an hour. Keep them refrigerated. Tip: Serve this cucumber salad as topping for a hotdog or a hamburger. You can make your own burger buns using this great recipe. I was just wondering how long this cucumber salad will last in the fridge once opened? Hi Kara. 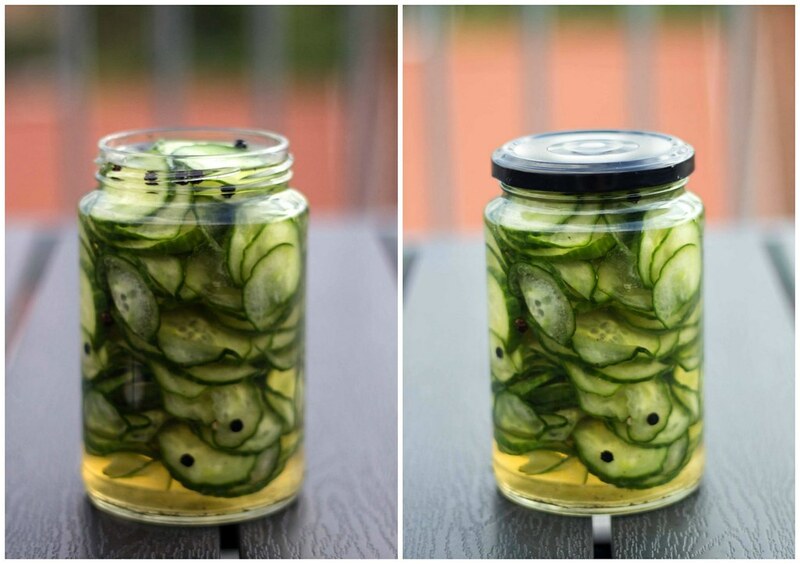 Your are welcome – I hope that you like this recipe :-) Since the cucumbers are kept in the vinegar it will last for a long time. I’m not able to answer your question directly. However, I’ve never had a glass of pickled cucumber which has gone bad. My guess would be around one month. You can with advantage clean the glass first with a little boiling – this will kill bacteria and extend the shelf life.